Typically, a multi-residential building has a bulk meter for each utility to measure overall consumption. The owner, property manager, developer or condo corporation is responsible for the bulk utility bills. Submetering measures the consumption of each suite and bills residents or tenants for their own consumption of any utility metered. Transparent accessible data allowing better control of costs at each property. Protection from utility rate increases. Submetering turns every resident into a utility manager reducing overall consumption by 30% or more. Reduces wear and tear on building infrastructure. Increases net operating income (NOI) and building value. Smart meters connect to the electrical panels that are typically located in the building’s electrical rooms. Each meter measures an individual suite’s electricity consumption. An electronic meter reading system remotely transmits consumption data to the Wyse billing platform. Billing processes the data and applies the approved rates and service charges. Each customer gets an accurate, transparent and on time bill. 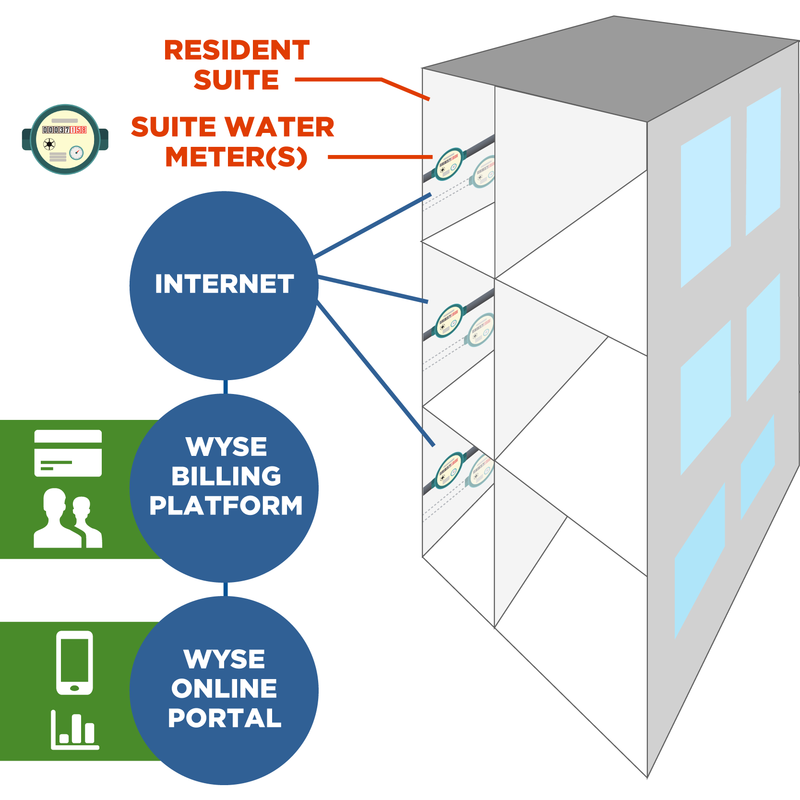 The Wyse online portal allows each customer, owner or manager to view usage and billing information. Wyse’s service team offers support. Customers reduce costs by reducing consumption. 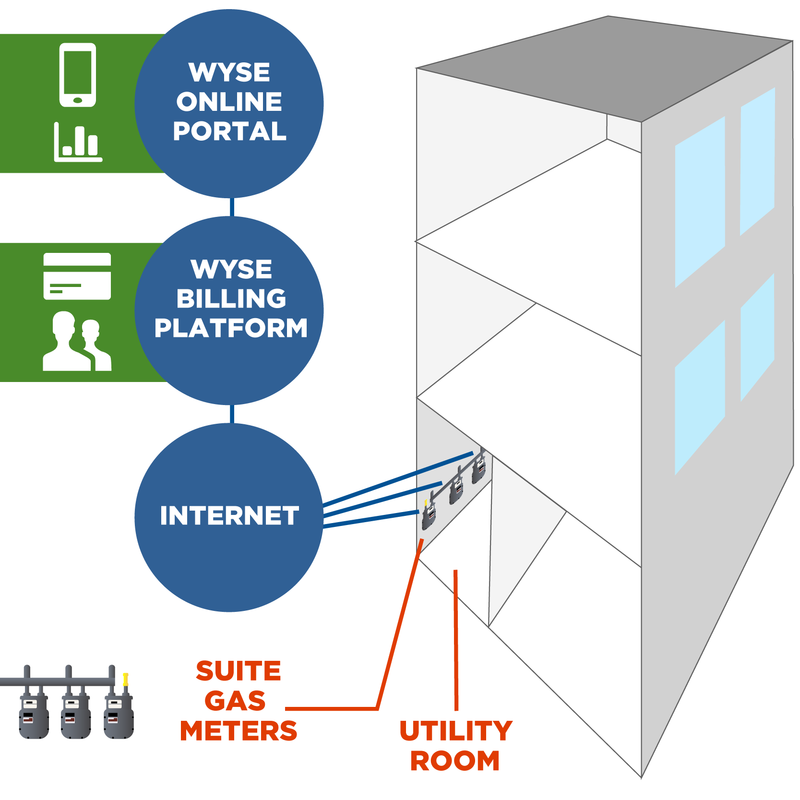 Smart meters connect to the water supply lines that are specific to each suite. Depending on configuration, there may be a meter for hot supply and one for cold supply. Each meter measures an individual suite’s water consumption. Meters have the capacity to detect lower water temperatures and unusual water patterns in the system. Customers reduce in suite costs by reducing consumption. Smart meters connect to the natural gas lines that are specific to each suite. Each meter measures an individual suite’s gas consumption. Meters and temperature probe instruments connect to the heating & cooling units (i.e. fan coil units) in the building’s suites. Each metering system measures the flow rate and temperature differential of the heating & cooling unit’s demands. This calculation captures each suite’s actual thermal consumption. 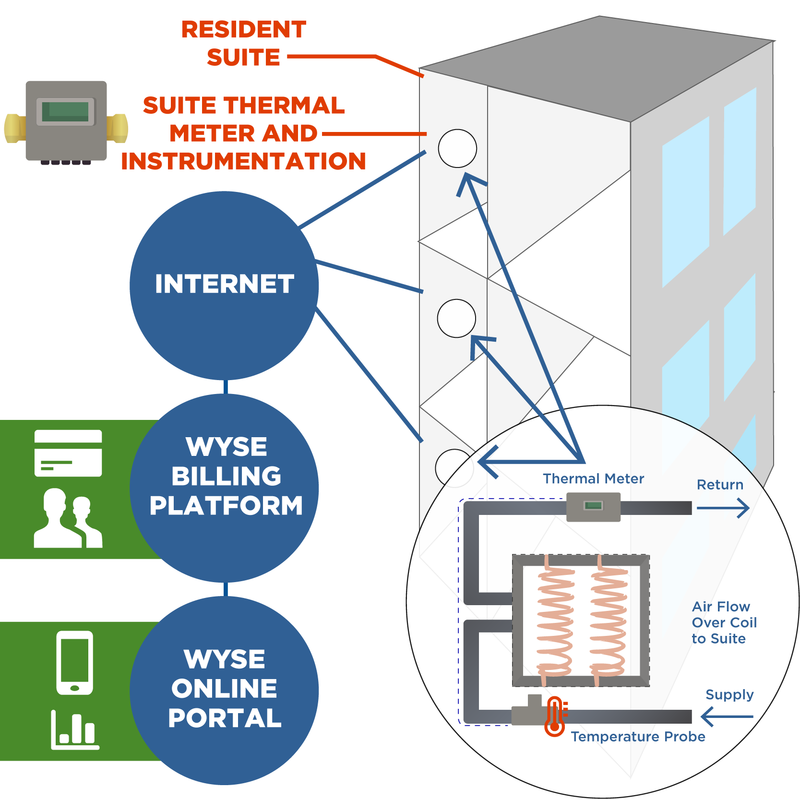 An electronic meter reading system remotely transmits consumption data to Wyse’s billing platform. Billing processes the data. This energy charge applies a rate that is representative of the energy input the owner charges. Each customer gets an accurate, transparent and on time bill.